Anyone meeting Dr. h. c. Henry J. Leir for the first time during the last decade of his ninety-eight years would have encountered a sleight, silver-haired, and bespectacled individual, who was—clearly—every inch a gentleman. From his immaculate, tasteful suits to his polite manner, everything about him was reserved, quiet. At the same time, within the first few moments, you would have also surely been struck by his steely and perceptive gaze, the strong and expressive jaw. You may have caught yourself wondering how this genteel, gentle appearance and manner coalesced with the commanding and assured spirit. Known internationally as a key industrialist, Mr. Leir made a fortune in metals and mining in Germany and in Luxemburg before expanding to South Africa and Japan and establishing offices in Luxemburg, London, Paris, Tokyo, Mexico City, and Düsseldorf. Authority, perception, clarity. 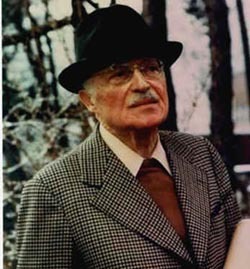 And while this entrepreneurial success is a critical part of Mr. Leir’s story, it is perhaps more important to know that he was born on 28 January 1900, in Beuthen, Germany, and left his business concerns in his native country in 1933, pragmatic and insightful enough to see what the Nazi party would do to his fellow Jews. More astonishing still is an even earlier defining crisis: Mr. Leir lost his father at the age of eleven and then stepped firmly into the role of pater familias for his Mother and six siblings. Even this thumbnail sketch reveals the sides of Mr. Leir that were to command respect: his strong and chivalric sense of responsibility, his almost unerring perception, his hearless confrontation of risks, and his pragmatic, yet visionary, decisions and subsequent actions. Yet, there is also that gentle, polite side to him. His most intimate friends complicate the portrait, when they reminisce about his sparkling wit and deep sense of humor. It is no accident that this brief sketch of Mr. Leir’s life begins with a quote from the German poet, Rainer Maria Rilke, who was one of Mr. Leir’s favorite writers. The two share the deep appreciation of quiet lyricism and gentle humor, of infinite appreciation for the world’s beauty. Considering his life circumstances, it is touching to learn that Mr. Leir’s love of literature, languages, and the arts began early on, shortly after his father died. At twelve, he was honored for his achievements at the local Gymnasium, something on the order of our prep schools here in the U.S., and at fourteen, Mr. Leir was already teaching others French. Importantly, he learned Latin and Greek, languages and literatures he cultivated throughout his life. At sixteen, he graduated from Gymnasium, but instead of going on to university, Mr. Leir needed to provide for his family, and so he began an apprenticeship with a mining company. The love of literature and the arts, along with the importance of a humanist’s education in Mr. Leir’s life –these perhaps provided him with solace through the difficult times of his younger years, maybe they helped hone his perceptions on the human condition and thus too helped him see the humor as well as the hardships, the possibilities as well as the limits that were constantly a part of his day. Certainly, his education and his professional experience served him well as he wrote La Grande Compagnie de Colonisation in 1937, a book written under the pseudonym of Tom Palmer during World War II that prefigured the European Union. And to offer yet another glimpse into his life, both his education and his professional experience allowed him, over the years, to collect works of art, such as the quiet, contemplative Asian paintings and artifacts that grace his small private museum. The early necessity to care for his family, his obvious intelligence and discipline, his continuous appreciation of languages, literatures, and quiet beauty, and his sense of humor—all this formed Mr. Lier’s approach to life. Perhaps it is in this light that his philanthropic activity is best viewed. As soon as he sold his company, Mr. Leir established foundations that would make generous gifts to hospitals, underprivileged children, Jewish institutions, and universities. Perhaps, it is also best to see Mr. Leir’s many honors in this light as well—from several universities’ honorary doctorates to the French Legion of Honor award to Luxembourg’s highest honor awarded to a civilian. A cultivated, visionary, and generous industrialist, Mr. Lier was truly an astonishing individual. He even went to work on the day before he died on 15 July 1998. It is to commemorate this multi-faceted and extraordinary gentleman, that the Ridgefield Foundation and the Leir Foundation continue his philanthropic work. It is in this spirit that the Leir Center in Luxembourg-Clark University hopes to contribute to his memory.